This is Rick with his new 9-6 Nova. We spent weeks talking about this shape in the parking lot at C St and in the lineup. 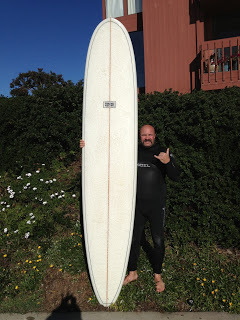 Most experienced surfers know how they want their board to look and feel, and Rick is no exception. The challenge for surfer and shaper is getting that vision communicated. In Rick’s case it took us three attempts to translate Rick’s vision into a reality. The other two boards were solid shapes, but just not what Rick had in mind. The second shape was close, but needed some small tweaks in thickness and nose rocker. With Rick in the shaping bay, we went over each dimension multiple times, adjusted tail-v and re-shaped the tail from mini-square to round-pin. Satisfied with the shaped blank, we put it in Ray’s capable hands and here is the result. I expect my customers to be heavily involved in the creation of their new shape. It takes time, effort, patience and, most of all, mutual trust in the process.